This is the best time to get Sky TV with this amazing discount! You can chose the ideal bundle for you and your family! With loads of options available. So get SKY tv for less today! Best Deals from Sky TV for Police Discount Offers. The packages include all the best channels and newest shows from as little as £33 a month. Sky continue to provide some of the best TV deals on the market. If you are looking for great TV and broadband we would recommend the above offers! Have you seen the latest shows available on sky? They continue to provide awesome TV, for example Game of Thrones! Which has been a huge success around the world. The best deals are usually reserved for new customers more often than not, existing customers don’t benefit as much. However, just before Christmas SKY do have offers for their existing customers so make sure you come back and continue to check the offers to make savings for your police family. There is a link at the bottom of this page. What do you get with Sky Package? Sky don’t provide any specific Police Discount, however they do continue to send us their very latest deals and what’s included with each package. 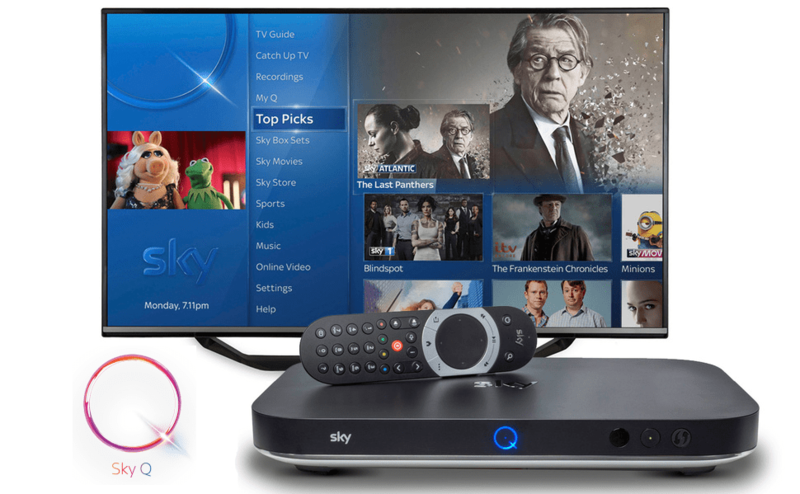 The most recent edition to all Sky Packages is their SKY Q box and Sky Q hub (If you order broadband). The Sky Q Box will allow you to record 3 shows and watch a 4th, plus store up to 500 hours of tv! SKY GO is also available which allows you to watch shows live and on demand on mobiles, tablets, computers which paying any more. It also has a feature of setting your Sky Hub box to record or download when you’re out, so you will never miss any of your favorite shows. The Sky Q Hub has built in Wifi and they claim it’s 3 x faster than previous TV boxes. Sky have also won several broadband provider awards in 2017 and 2018 which means that they will take some beating. Get Sky Entertainment + Sky Broadband Unlimited from only £33 a month. Add Cinema, boxset or Sports channels as extra. Get Sky Entertainment + Sky Fibre Unlimited for £40 a month with average broadband download speed 34Mb. Add Cinema, boxset or Sports channels as extra. Sky Fibre Broadband Unlimited for Less! Amazing broadband deal. Now only £25 a month. Includes line rental and Superfast unlimited sky broadband. Get some great offers on SKY TV today when you sign up or upgrade. If you have been with Sky for years and looking for some discount then make sure you check out the offers from their online upgrade page. Here you will find deals from Movies to Sports and everything in between. However if you feel that these offers don’t provide the discount you like or that you deserve (after years of loyalty) then the next thing is to ring them direct. Users of this site have said that when they have contacted Sky direct they do get a better deal than what was offered. It’s worth a try! Upgrade your Sky Package NOW! Upgrade your SKY Package for less today - Check out all these Amazing offers and don't miss out! Is the Sky offer still applicable as when you click on any package the unlimited broadband offer seems to drop off? Hi there – Yes I believe that offer is still on. Thanks.